Coronet Peak ski field near Queenstown, NZ during their South Island safari. Rotarians get involved in many community activities, and in my 28 years in Rotary, no event has brought me greater pride than helping the selection of students to go to another country, to share in family life attend school with a commitment to learn and to enjoy a new culture. I have moved on to other things in Rotary as a Governor, and serving on the Board of Rotary Down Under with fellow directors from Australia, but I thoroughly enjoy continuing to offer my services to interview students and families for the Rotary Matched Student Exchange Programme between New Zealand and Australia. This programme is a short exchange of 12 weeks, with secondary students selected from Year 9 (the first year at secondary school) to go on a matched exchange to Australia in the following year. 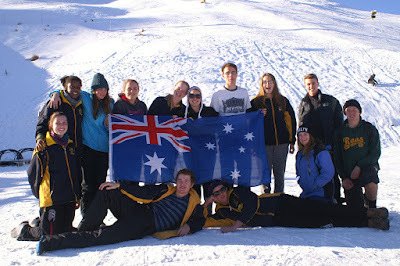 Kiwi students go to South Australia, New South Wales and Queensland early in Year 10, and a selected matched Australian student comes to New Zealand for 12 weeks. The lead up to selection is exciting, with much anticipation. Families get into the process of selection – will it be good for my son or daughter? can we afford the cost of travel? how will they get on living with another family, and what if there is a falling out? The answers to these questions are sorted out in family interviews, and this is where I get my kick, as I love dealing with these issues and dozens of others. The smiles come on the faces of students and their Mums and Dads when you show genuine interest in their well-being, that you are there to help build their confidence and to make the exchange experience a memorable one. If the match is made and the students are well prepared, they will fit into their exchange as planned. With full knowledge given to them by their selectors and mentors, it is a very successful Rotary venture. When you get a big hug and thanks at the end, you really feel part of their family. It is great for Rotary’s profile.